Chateau de Husson dates back to 1890, when it the Southern Rhone Valley domaine was created by the Granget family. When Jean Pierre Hugues and Anne Hugues purchased the property in 2008, they began a program of modernizing the estate, their vineyard practices and completely renovating their wine making facilities. They also shortened the name to of the estate to Chateau Husson. The Hugues family were experienced wine makers by that time as they had been producing wine since 1986 in Luberon at Domaine de la Royere. Chateau de Husson was sold to Aubert Freres in 2015. Aubert Freres also owns Chateau Le Grand Retour in the Chateauneuf du Pape appellation. Chateau Husson owns 10.9 hectares of vines in Chateauneuf du Pape. 9 hectares of vines are used for growing red wine grapes and the remaining 1.9 hectares of vineyard and are planted with white Chateauneuf du Pape grape varieties. Chateau Husson produces 2 red Chateauneuf du Pape wines and one Chateauneuf du Pape white wine. Starting with the 2014 vintage, they began producing another Chateauneuf du Pape wine under the name of Anne Hugues Domaine de la Royere. Chateau Husson Chateauneuf du Pape is a blend of 95% Grenache and 5% Syrah. The wine is aged in a combination of foudres and French oak barrels. On average, the production is 2,000 cases per year. Chateau Husson Chateauneuf du Pape Les Sainte Vierges is produced from a blend of 60% Mourvedre and 40% Grenache. The wine is aged in French oak barrels for 12 months. On average, 350 cases are produced each year. Chateau Husson Chateauneuf du Pape Blanc Les Sainte Vierges is made from a blend of 60% Grenache Blanc, 20% Bourboulenc and 20% Clairette. 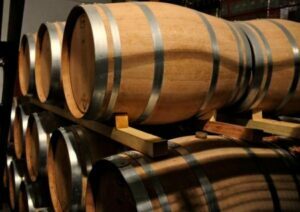 The wine is aged for 4 months in a combination of new and used French oak barrels. The production is close to 750 cases per year. Chateau Husson is best served at 15.5 degrees Celsius, 60 degrees Fahrenheit. The cool, almost cellar temperature gives the wine more freshness and lift. Young vintages can be popped and poured, or decanted for an hour so. This allows the wine to soften and open its perfume. Older vintages might need very little decanting, just enough to remove the sediment. Chateau Husson is best served with all types of classic meat dishes, veal, pork, beef, lamb, duck, game, roast chicken, roasted, braised, stewed dishes, sausage and cassoulet. Chateau Husson is also good with Asian dishes, hearty fish courses like tuna, mushrooms pasta, eggplant and tomatoes. The white wine of Chateau Husson is best served with a myriad of different seafood dishes, shellfish, crab, lobster, sushi, sashimi, chicken, pork and veal, as well as Asian cuisine. Jean Pierre and Anne Hugues also own Domaine de la Royere in the Luberon appellation as well as 10 hectares of vines planted in the Cotes du Rhone and Cotes du Ventoux appellations. Medium bodied, soft, polished, fresh, bright and fruity with an earthy garrigue and olive character to the finish. The wije was made from blending 60% Grenache, 37% Mourvedre and 3% Syrah. Light, easy drinking, soft textured charmer that keeps its focus on getting the most from its raspberry and cherry core. Medium bodied, with a floral character in the red fruit, the wine is open and accessible. Medium bodied, open and accessible, there is a softness in texture in the peppery, kirsch finish. Fresh, lively, vibrant, tannic and demanding time, this spicy, red berry filled, rustic wine demands time before it is fun to drink.